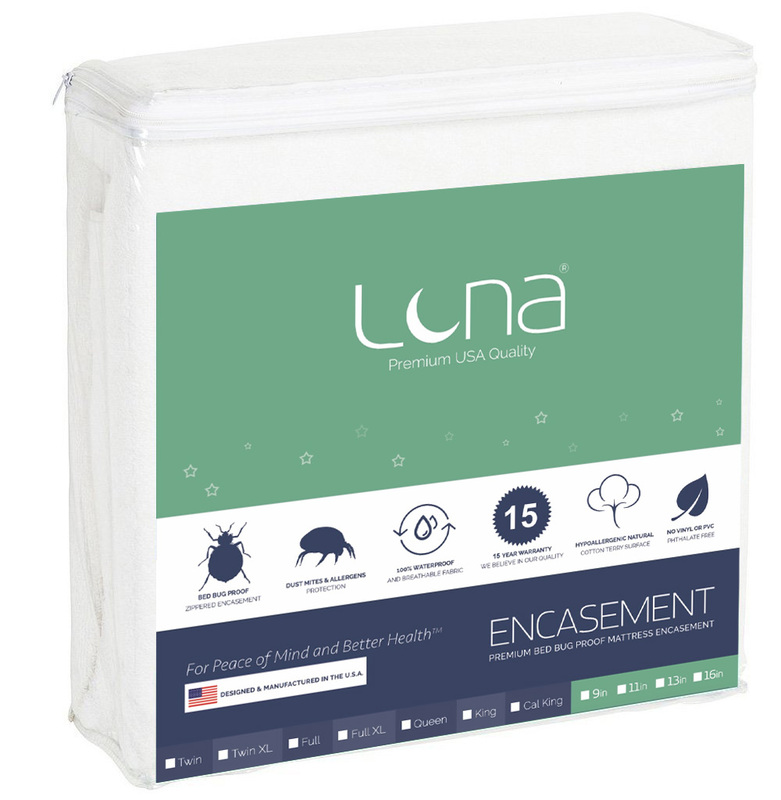 Luna Premium Hypoallergenic Zippered Waterproof Bed Bug Proof Mattress Encasement 11"
For the ultimate in bed bug, fluid, allergy and dust mite protection we offer our fully encased, yet breathable, certified bed bug proof zippered mattress encasements. 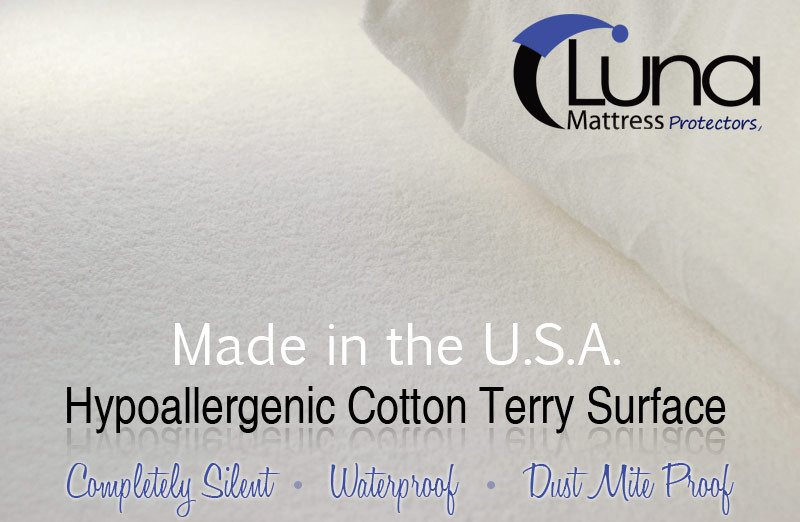 Full: 54" x 75"x 11"
California King: 72" x 84" x 11"
What makes us different than most mattress protectors and encasements found in today’s marketplace is the fact that we use cotton terry for our surface material. Cotton terry is not only the most expensive material used to produce premium mattress encasements and protectors, but also requires a complexed manufacturing process. Whether you choose to buy from us or someone else, we would highly recommend only choosing a protector product with a terry cotton surface. Fluid spills and incontinence issues with adults, children or animals can quickly turn an unprotected mattress into an ideal environment for dust mites, bacteria, mold and fungus. Cleaning a soiled mattress is also very difficult and often results in chronic odors that can ruin your mattress. Our mattress protectors are completely waterproof and use a hypoallergenic cotton terry surface to absorb fluids. Stains are also repelled, which helps safeguard your mattresses manufacture warranty. After a fluid accident, our mattress protectors can be placed directly into the washing machine and tumble dried on low heat. Once dry, simply place the protector back on the mattress and you will be fully protected again. For the ultimate in health benefits and bed bug protection we offer our premium zippered waterproof mattress encasements. With our zippered encasements, your mattress is completely surrounded on all six sides preventing bed bugs, dust mites, bacteria and fungus from entering. 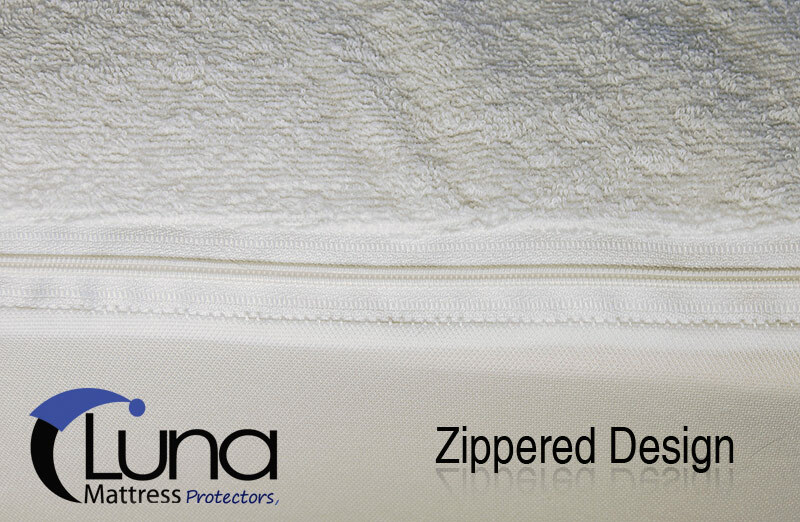 Although the mattress is encased, its still able to breathe properly using our exclusive Luna Airflow Technology. This helps prevent heat buildup and sweating. Bed bugs are becoming increasing more prevalent and can not only ruin your mattress, but can cause health issues as well. Our mattress encasements are designed for the treatment and prevention of bed bug infestations of the mattress. This means that bed bugs are not able to bite through, enter or exit the encasement once applied to the mattress. 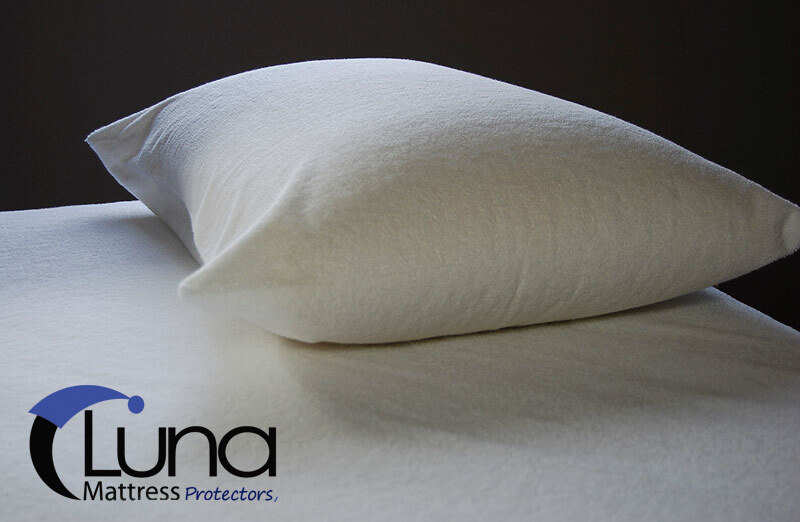 Luna premium mattress protectors are a must have for those suffering from allergy triggers such as pollen, mold, dust mites and fungus. 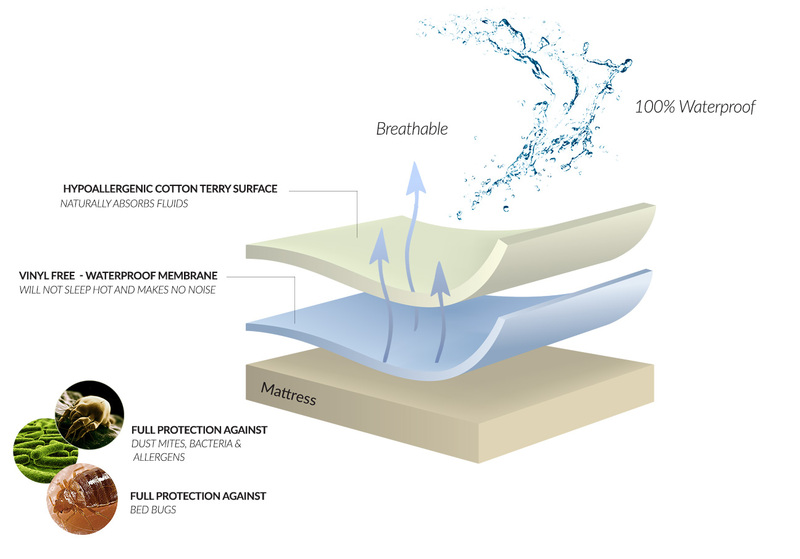 Our protectors are effective in preventing 99% of allergy triggers from penetrating through the membrane cover while still allowing the mattress to breathe. Periodically wash the mattress protector, like you would you sheets, and you'll be able to remove allergy causing triggers that may be resting on the surface of the protector. Our protectors make for a more sanitary and healthier nights sleep (please see our Care Instructions and Dust Mite Section). My bed bug encasement came in the mail just 2 days after ordering. It fits well on the mattress and is doing a great job treating my mattress with bed bugs. Excellent quality product. Everything was as described on the site and the product was very well packaged. The 9" encasement fit great on our Cal King mattress.